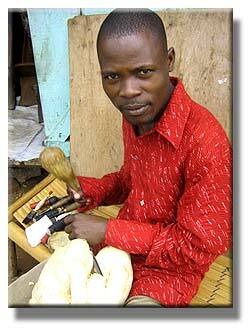 Mr. Wasswa Hurry Tonny, a.k.a Waspex,. His eyes are glued to his latest piece of art - an unfinished sculpture of three monkeys seated in a circle, seemingly deep in conversation. His hands move fast, turning the sculpture over swiftly after every cut he makes. You would believe his hands belong to a mother that is bathing her little baby. 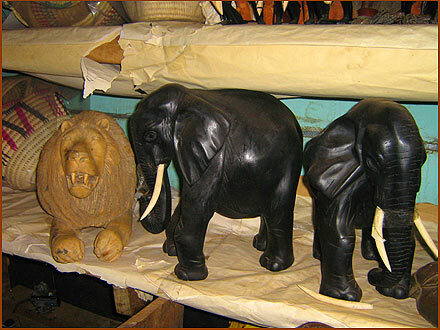 Tonny Hurry Wasswa gives his all to his sculptures. It takes a serious mosquito bite to make him momentarily take his eyes off his art piece. "At this point, I do not want to make a mistake," he told me after some time of waiting to get his attention. It is at this time that Waspex, as he prefers to be known, stretched his back after more than 15 minutes in the same position. He tells me that he usually stretches only to glance at slowing cars in anticipation of a customer, and often returns to his work immediately. Waspex turns a log into a sculpture. Through our discussion, I realized what potential Ugandans have and why young people with any form of art or talent should never sit back and cry about unemployment. Below are excerpts from my meeting with Mr. Wasswa Hurry Tonny, a.k.a Waspex, a sculptor and the proprietor of Waspex Crafts Shop in Kitubulu, Entebbe. Waspex: I have always worked hard. Sculpting is my main source of income and I have been earning some cash from selling my artworks. Olive: What do you sell in your shop? Waspex: I sell different kinds of art pieces, some of them are my own creations and others are from other artists. Some of the products I deal in are chairs, animal sculptures and portraits. I have bead necklaces, baskets and masks too, among others. Some of Waspex's work on a shelf in his shop. Olive: When did you start sculpting? Waspex: My journey to sculpting began while I was a primary seven (the equivalent of 7th grade in Uganda) pupil at St. John Baptist Primary School, Kikuba Mutwe in Kisugu. 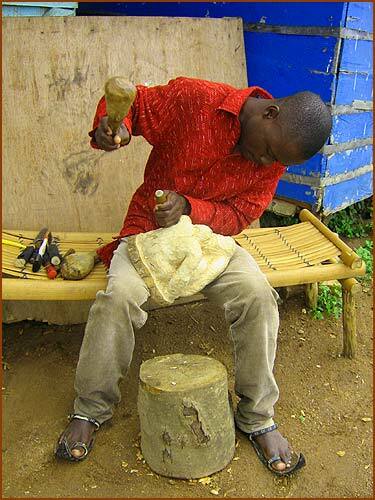 There were some Congolese men living in my neighborhood (Lubuga Zone, Kisugu, Kampala) who taught and helped me hone my skills at sculpting. I continued to perfect my skills and if you look critically at my work, I think that I have truly come of age. The rest, as they say, is history. I do my work with one heart because the quality of the finishing is admirable enough for a customer to buy my pieces without hesitation. Olive: What kind of materials do you use to make your products? Waspex: In the past, I used mvule but now that it is rare, I have resorted to using mugavu, a sister tree to mahogany. 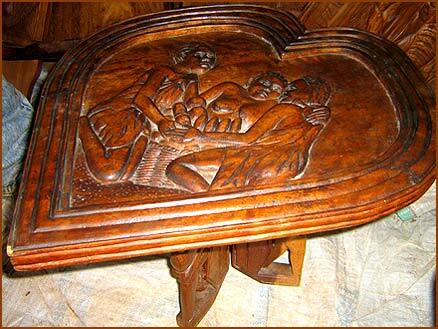 It is a hard, reddish-brown kind of timber, which I use for making the chairs, tables, chests and hangings. 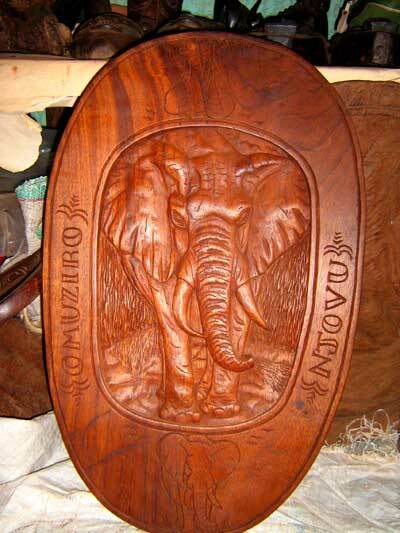 However, for the animal sculptures such as the elephants, lions, monkeys, I use jacaranda wood. This kind of wood is good as it does not easily crack and insects cannot eat into it. I usually buy the logs and carve the animals out of them. It is interesting to see a mere piece of wood turn into a magnificent work of art. Olive: How much do the raw materials cost? Waspex: About 17,000 Uganda shillings per good log. Olive: What inspired you to do what you do? Waspex: I love art and nature. This can be noticed in my carvings. They are mainly wild animals and depict nature at its best. I do a few sculptures about society. I was touched by the encouragement from my friends when I had just begun this work, Kintu and Idris being the most supportive. Kintu would even break my art pieces if he was not satisfied with the outcome! This pushed me to strive to improve my products. Besides, I did not want to idle away at home when I knew I am gifted by the work of my hands. I decided to utilize my talent instead of wasting it. Olive: How long does it take for you to finish a sculpture? Waspex: When I am doing a piece or carving, it typically takes me between two to three weeks to finish it. Olive: Why not use modern machines to do the carving? Waspex: Not really. I use a chisel and a carved out, wooden hammer to do my work. For some of the designs I use on the tables, I trace the images onto the pieces and then carve them out carefully so that the design comes out exactly as I have planned. Olive: How much do your sculptures usually cost? Waspex: (laughs).... I cannot tell you the exact price because it all depends on the size of what the customers wants. It is usually negotiable. Olive: Do you love the kind of work you do? Waspex: Absolutely. This is because my art pieces are mainly educative. I become happy when I see a potential customer looking at my work intently and openly admiring it. It is a great pleasure to know that my work has filtered through to that person's heart and soul. Olive: Do you experience any problems? Waspex: Yes, I do. First of all, I get rather few customers. This is mainly due to the location of my shop. I am situated on the Entebbe-Kampala highway so tourists and locals usually whiz past without offering me a second glance. Equally, lack of sufficient funding to showcase my work has bogged me down. I hope that someone can come to my rescue and sponsor me soon. I would also be grateful to be given a more strategic place to sell my collection. I would take up with open arms any offer I got. Olive: Tell me about your key customers. Waspex: My customers are usually ladies who want me to make framed portraits for their boyfriends, romantic words inscribed and all. I am the guy who made the sculpture at Kiwatule Recreation Center. Olive: What is your business plan for the future? Waspex: I have been in this business for only five months but I am quite optimistic that one day I will make it big. I would also like to target CHOGM (the Commonwealth Heads of Government Meeting slated for November 2007 in Kampala). My future will be brighter if all these plans come to fulfillment. I call upon those wishing to help me financially or want to buy my items to e-mail me on waspexsculptor@yahoo.com or call me on +256782414957. If you are ever in Entebbe or nearby areas, you can visit my shop, Waspex Crafts Shop at Kitubulu stage, opposite Ssese Gateway Beach. Typical results from Waspex's sweat. Olive: Can you offer me a beautiful piece to take to my boyfriend? Waspex: (laughs...) A gift to the person you love is never offered to you by anybody else. It is bought. Olive Eyotaru Yemima is a graduate of Mass Communication. She first worked with Ultimate Media in 2005 as an intern and returned in 2007 as a features writer. A Ugandan talented creative writer, Eyotaru now writes for both the local and international media and continues to shine in the media every day that passes.